Scarring Alopecia is likewise known as Cicatricial alopecia, which means an inflammatory hair loss problem. It results in uncovered patches on the scalp because of lasting destruction of hair follicles. The main tissues, that are present in the hair get replaced, scarred, and destroyed by fibrous tissue. Then, the hair cannot be regrown because the hair follicles get destroyed. Sometimes this type of alopecia begins as a non-scarring type of alopecia that gradually advances into irreversible and permanent baldness. Scarring Alopecia is a kind of baldness or hair loss, that is mainly caused by the destruction of hair follicles. The prevalence of scarring alopecia is about 7% in people who are generally healthy and strong. Individuals who get uncovered or bald due to scarring alopecia for the most part experience the ill effects of distress in light of the fact that there is no real way to restore or regrow the hair. The main symptom of Scarring alopecia is at least one permanent bald patch on the scalp. These patches may stay discrete to deliver greater bald zones on the scalp. The skin pores are a result of a complete loss of hair follicular openings. The signs of scarring alopecia may vary dependent on kind of alopecia. Anyway, some ordinary symptoms of scarring alopecia incorporate burning of the scalp, itching scalp, pain, crusting, patches of rough and scaly skin, and pus of purulent discharge from the scalp. The reasons for Scarring alopecia are not seen completely yet but rather inflammation appears to the main contributing factor. 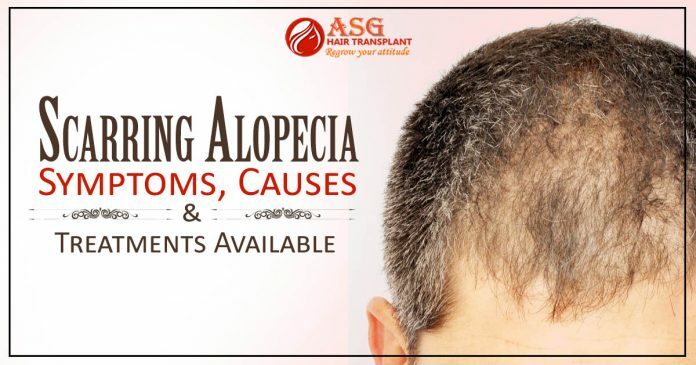 Most kinds of scarring alopecia are prompt by permanent devastation of hair follicles because of dynamic deposition of collagen, aggravation, and due to loss of sebaceous organs. Hair-care habits that incorporate extreme utilization of hot brushes, relaxants and straightening irons can likewise be in charge of scarring alopecia, particularly in ladies. Numerous experts summarize the reasons for scarring alopecia such as inflammation, injuries, burns, tumors, destruction of hair follicles, and genetic factors. The objective of treatment for scarring alopecia is to prevent complete baldness and male pattern baldness. This process is mainly used to cover the bald zones utilizing hair wigs. Since hair regrowth is not possible at that time, the hair loss treatment is basically expected for lessening the side effects of aggravation. Hair transplant surgery can be performed to cover bald patches just if there is adequate donor hair somewhere else on the scalp. Since the essential scarring alopecia can be brought about by various inflammatory cells, for example, lymphocytes or neutrophils, the treatment alternatives differ for explicit kind.